Check out my results as Phd student. Doctor in Computer Graphics, I'm currently working as a 3D Graphics Engineer at Ulsee, United Kingdom. I'm interested in all kinds of Computer Graphics professional experiences. My research focus is on rainrendering in real-time. Contact me if you have any questions, or if you are interested in a research collaboration. Desired living countries: France, USA, UK, Australia, Canada, Japan. and improve the existing ones. Collaboration with Kazuki Nanko, Japanese Ecohydrologist in the Forestry and Forest Products Research Institute, Japan, to develop our phenomenological model for dripping dropsrendering. I present a coherent multiscale model for real-time rain rendering which takes into account local and global properties of rainy scenes. Our aim is to simulate visible rain streaks close to the camera as well as the progressive loss of visibilityinduced by atmospheric phenomena. 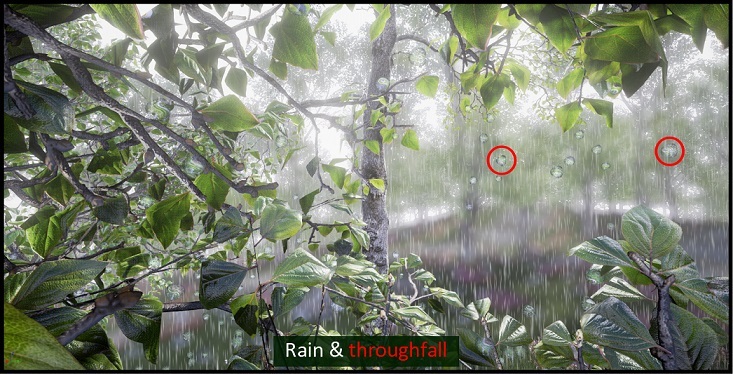 I aim at rendering interactive visual effects inherent to complex interactions between trees and rain in real-time in order to increase the realism of natural rainy scenes.